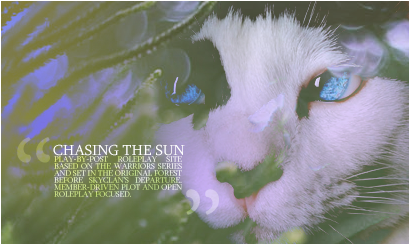 The temptation to devour the prey that Kit had carefully caught well away from Clan territory was strong in the young tom as he sat with it nestled between his paws at the SkyClan border. His hunger made his stomach physically ache—he couldn’t recall the last time he’d been lucky enough to catch anything more than a moth or two and the fat squirrel he’d managed to find was taking every ounce of his willpower not to devour. He hoped it would speak leagues to his politeness to bring the Clan he hoped to join an offering for his arranged meeting, but he couldn’t deny that he was lightheaded with hunger. It’s alright, Kit thought, angling his ears toward the teaming forest before him. The squirrel had been fat and slow when he’d stumbled on it, and it had been a lucky catch, but maybe it would convince the Clan cats that he had some promise as a hunter. Was that lying? Kit doubted he’d appear very capable at hunting since the weather was warm and he was so thin. The brown and white tabby tom raked his tongue over his shoulder self-consciously, aware that his body was thin and scraggly. That he looked every bit a desperate rogue. Not inaccurate I suppose, I am desperate. What if they took one look at him and turned him away? Kit’s stomach lurched and he shuffled his paws nervously. He’d gotten an agreed meeting but he couldn’t say for sure whether the warriors he’d met at the border had been kind enough to speak for him. Or even if they were going to bring an entire squadron of cats to fight him off and leave him eating Sloe’s words in his dreams for moons to come. Have faith. Kit shook himself sternly, and took a shaky breath. He was patient. He could wait—starving yes. Desperately tired and terrified, also yes. But he could swallow it and put it down into a corner if he focused hard enough surely. He’d show this Clan leader the utmost respect that he had been taught in his young life. 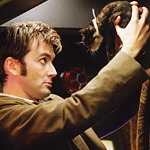 He’d show him that he was a sensible young cat that could be, quite possibly, beneficial to his Clan. Even so, he couldn’t stop the hammering in his chest. He was young still, and unpracticed terribly in the art of fighting. 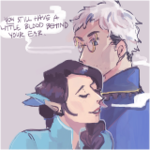 If anything at all he knew more about herbs and remedies—and that had never quite stuck with him as well as Sloe had wanted. Kit squirmed in place, every moment that ticked by was making his paws itch. The prey at his feet was ever so tempting, and he finally decided to keep his chin forward and his eyes straight. Don’t even look at it. His stomach growled loudly, Kit twitched his ears and grit his teeth. Be patient. Soon the squirrel would be out of his paws and he’d know whether or not he’d have to resort to starvation or the kindness of a passing loner. Or maybe twolegs—though the idea made his pelt crawl with strange discomfort. It wasn’t very often that Pinestar was told of a rogue wanting to speak to him. Of course, it had happened in the past. Once in his first moon as leader, and plenty to Teaselstar while he was deputy. Yet, it has his interest peaked, a young, rather pathetic looking tom who wished to talk to him about joining the clan. He almost wanted to scoff at the mere idea of it. Rogues were rogues, there was barely anything good about them. His last mistake brought into the clan certainly hadn’t turned into anything worthwhile. Hawkpaw had only proved himself to be constantly petrified of the clan around him and unwilling to accept the full expectancies than came with it. 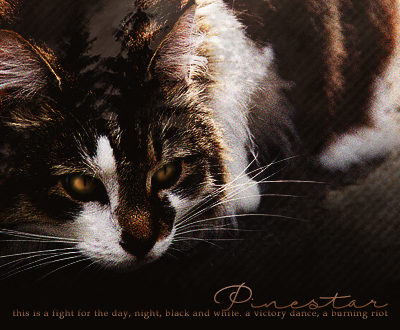 If he hadn’t been a kit (Pinestar would never turn away a kit, StarClan forbid, he respected the warrior code more than that), no doubt he would have sent the cat on his way if he showed such tendencies. Yet, wasn’t that the point a cat was supposed to help? To open their heart and try to improve life? He supposed it was. Maybe that was why he was even bothering with this meeting, simply due to the descriptions Lioncloud had muttered his direction of the cat’s state. He didn’t sound a threat, and certainly didn’t sound like the typical every-cat-for-themselves sort of rogue Pinestar was used to. He sounded like another lost soul. Maybe it was his compassion winning out over logic for once. Who knew. No matter how much Pinestar might have pondered on the why and what as he slowly padded through the twisting roots and thin undergrowth of the forest, the fact was he was attending this requested meeting, and he had his ears and heart open. The rogue had better make the trip worthwhile, if he was serious. There was always the chance that it was nothing but a panicked blubber while he tried to escape. Pinestar brought his movements to a slow, his sharp amber eyes peering through the trees toward the border. Sure enough, tabby and white fur stuck out against the tall oaks, the tangy, unfamiliar scent of the cat wafting down toward him, along with the scent of something else. Squirrel. For a moment, he was suspicious. Had this cat really been treading inside the territory of the clan he was asking to join? Yet, he couldn’t taste the cat’s scent anywhere else nearby. It came from one direction alone. He supposed, there were plenty of other trees in the forest. Pinestar started to move again, lifting himself tall, and puffing out his own tabby and white fur with a huff. His head and tail stood high, and the leader made no effort to conceal his movements, paws cracking against a few stray sticks that lay across the soft forest floor. He didn’t speak straight away, his gaze just focused on the rogue, studying him carefully and quickly, sizing him up. NOTES: sorry this took a bit to get to!